In May we headed for Essex and visited West Mersea and Audley End House while based at the Premier Inn, Springfield, Chelmsford. It was hard to believe that, having grown up in on the northern bank of the Thames that I had never visited West Mersea before. On May 19 we avoided main roads for we wanted to enjoy the country lanes of Esssex. Unlike in North Yorkshire at that time the trees were fully adorned in spring green in shocking contrast to the vivid yellow of the blossoming rapeseed. I still see the latter as an interloper in the British countryside – even if it is now an important cash crop. At The Strood we were surrounded by mud for it was low tide as we crossed what is one of the few true causeways connecting a community to the British mainland. 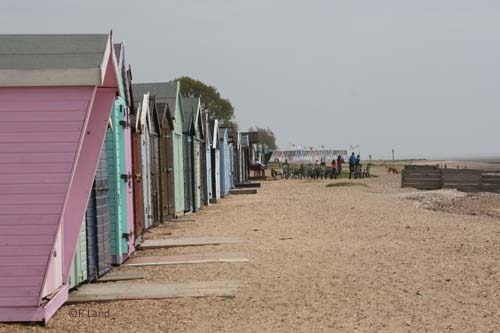 After a quick look at East Mersea we headed for the Victoria Esplanade at West Mersea with its remarkable long line of beach huts – and were glad to find the Two Sugars seafront cafe where we could sit and watch three sprit sail rigged barges and a yacht race. Sadly it was too hazy to get any good photos of those barges. We enjoyed a gentle and enervating stroll along the beach, fascinated by the odd shapes created when oysters had glued their shells to those of their neighbours. Like us many others were making the most of some warm sunshine after a cold winter. Our next stop was the Mersea Island Museum. I had found this originally when searching the internet for information about the Thames sailing barges that my grandfather had been the master of. So I had hoped to find out more by visiting it. This small, independent museum did have lots of interesting information about fishing, oystering, wild fowling and local boat building – but nothing more about those Thames sailing barges. So after an hour or so we went back to the Premier Inn at Springfield in Chelmsford. On arrival there we were delighted to find there were comfortable seats, a bar and a restaurant near the reception. The staff were exceptionally friendly and very helpful concerning any food allergies and intolerances – so much so that we ate there each evening. The highlight of our Essex trip should have been our visit to the Jacobean mansion at Audley End near Saffron Walden on the Monday. I had checked the English Heritage website beforehand but there was no warning that the main house would not be fully open at that time. Having made the journey there we did pay the full entrance even if we felt that was a bit much for just a whistle-stop 50 minute tour of the house. Our guides did a good job but it was nothing like having time to stop and browse in the various rooms, and being able to find out more about many of the interesting objects and paintings. 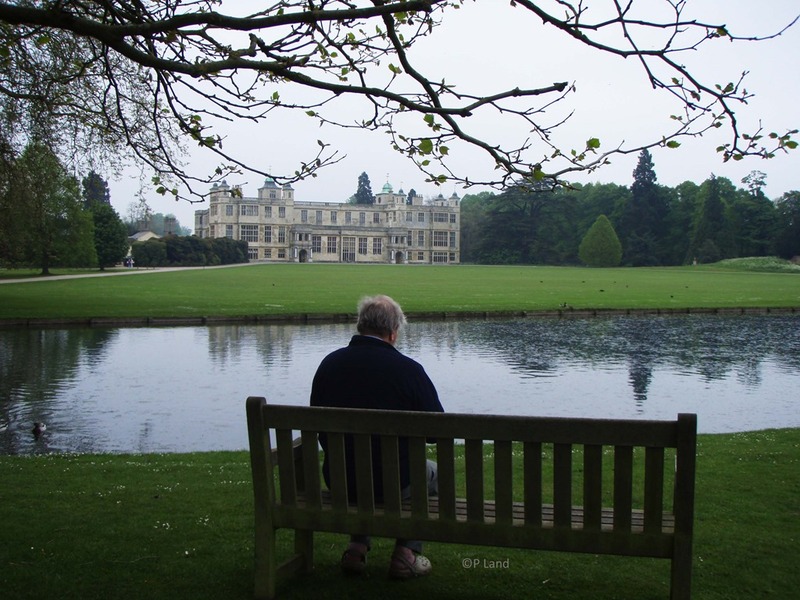 A seat near the stables provided the perfect place to study the house and reflect on that sweep of history which took in the dissolution of the monasteries by Henry VIII, the development of Audley End House into a Jacobean ‘palace’, and how later owners had to downsize it to make it economically viable. During the second world war it became the secret training base for the Polish Section of the Special Operations Executive. Our routes to and from Audley End again took in some fascinating ancient Essex villages such as Thaxted and Newport. The 15th, 16th and 17th century houses included some wonderful examples of pargetting (external decorated plasterwork) – and many timbered buildings which, have over the years, warped and become wonky or lopsided. The following day we travelled to Thurne in Norfolk as David’s boat needed some care and attention. On the way David took me to visit Bungay in Suffolk where we saw what was left of Bigod’s Norman castle. Bigod was a 12th century warlord who tried to create his own mini kingdom but was brought to heel and kneel by Henry II. Even more of interest was the Jesters tearoom which we passed en route to the castle. David was delighted that the advert that they made the best hot chocolate proved, for him, to be true. We enjoyed a gentle stroll around the town where I saw the Butter Cross for the first time and learnt about the legend of the Black Dog. We thought the weather that day wasn’t too bad until we reached Thurne. There the wind was so vicious and cold that it felt as if winter had returned! 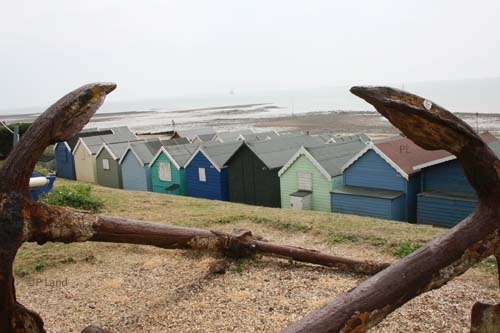 Below: More beach huts at West Mersea; and enjoying a view of Audley End House.